Congrats OSF Students applying for College & University: everyone got in for September (some with multiple offers)!!! Big thanks to Julie B for support with applications! OSF participating in another successful & sunny SWAP! OSF students volunteering at the BBQ: Swap MEAT! Strongman Ted: Thanks for inviting the OSF crew to Swap Meet at Roarockit! 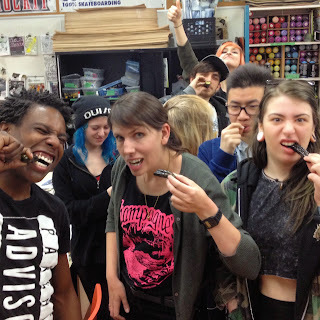 Youth Are Revolting: Art Show & Auction at Gladstone Hotel (April 2, 7-10PM) presented by Oasis Skateboard Factory & Roarockit! 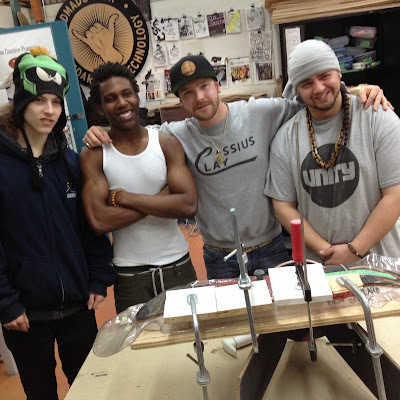 Artists and Students collab on a crazy skateboard incorporating exotic wood and metal for Thursday's auction! Wait to you see what this looks like!!! Save the Date for our Awesome Auction: Thursday, April 2!!! 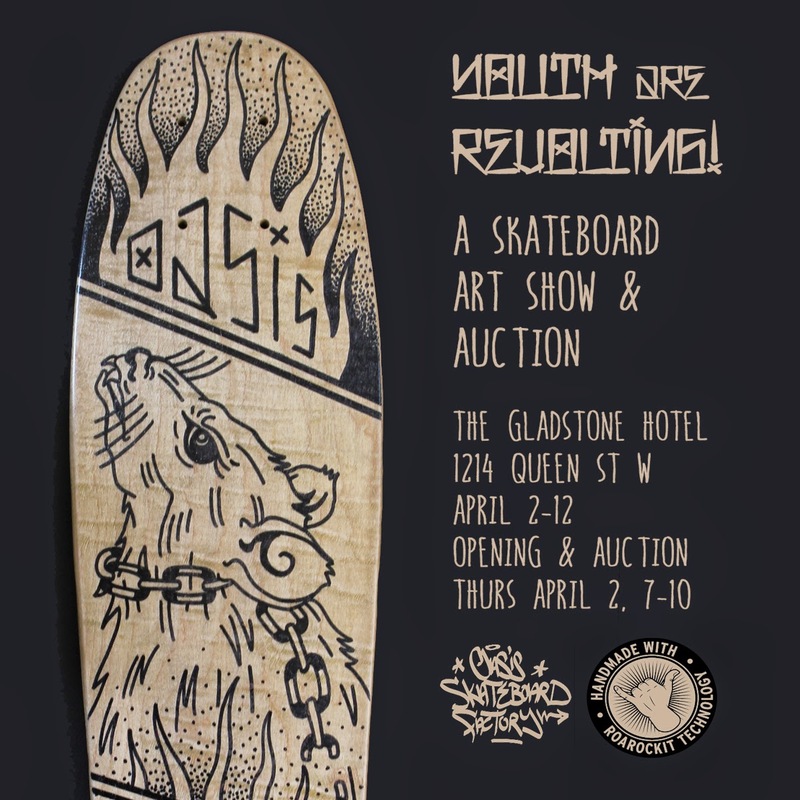 This April, the Gladstone hotel will host a retro mini-skateboard exhibit and silent auction of rolling artworks by high school students and local artists. For the show titled Youth Are Revolting, students collaborated with high profile artists to develop a series of boards based on the theme of teen stereotypes and rebellion. Come meet the student artists at the Gladstone Hotel (1214 Queen St. West) on Thurs. April 2 from 7-10PM and bid on one-of-a-kind art skateboards. 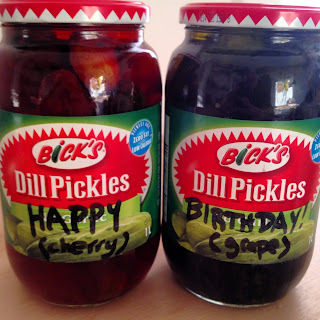 Sharing DIY Kool-Aid Pickles with Teacher Lauren on her Birthday! Eewww...YUUUM!!! Hi this is my first semester at OSF. My brand is Demewnic which a play on the word Demonic with a feline twist. My brand exists to take all things cute and turn them into you worst nightmares. My graphic on my first board is an image of a human wearing a severed cathead mask leaning against a tree in a moody environment. I used lots of red and black to communicate the dark elements of my brand. I made the graphic with spraypaint and paint marker. I made the actual board out of Canadian maple. This was the first thing I made out of wood and I’m really stoked to ride it! I learned to make sure every surface you do not want to spray is covered with paper so that you don’t get overspray, which is difficult to fix. On my next board I will be more careful spraypainting and manage my time better so I’m not rushed. 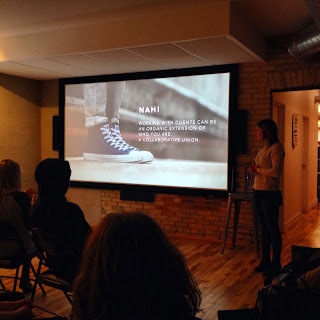 Overall, I have learned more in a month at OSF than my whole previous high school experience, from designing and creating my own brand and the related teamwork and communication skills. I can’t wait to freak people out with my next branded creation! My brand is based off my YouTube team. We make creative skateboarding edits and gaming. My brand exists to show that skateboarding can be more than just a rebellious crime; skateboarding is creative. I feel like the word “age” references the past and how time moves forward; skateboarding grew out of surfing but changed through time to be more of a whole culture with technical elements and opportunities for a career. At my “age” I see younger kids getting super good at younger and younger ages, so as time goes the standards improve. In the future I think people will see skateboarding more than as a sport but as a whole creative lifestyle and form of art. Skateboard is my favorite form of creative expression. This is my first skateboard I made myself. I made it out of Canadian maple which stronger because Canada is cold! I made my graphic by transferring my drawing with carbon paper onto tape and cut out stencils. I used spraypaint and faded the flames with orange to give my graphic texture rather than just a flat image. My logo is an “A” chopped up to make it look more futuristic; this is appropriate for my brand because my brand is based around how skateboarding traveling through time. Next time I will improve in my ability to incorporate more details into my graphics. Since I’m more of a computer person, I challenged myself to get back into drawing. OSF is improving my art skills and workflow; I’ve always been a slacker but now I want to keep my head in the game because it will help me in my future goal of running my own company. My brand is LGFU Skateboards. We exist to bring skateboarding back to its home roots: Punk Rock, pool skating, and destruction. Ever since I got into skateboarding I’ve been influenced by the Zboys and all the Thrasher guys; I’d rather ride a bowl or a pool instead of a ledge or stair set. My graphic is a dude’s fists tattooed and a bottle and tattoo gun. If you are living that lifestyle and make some bad decisions (chances are you are going to), at least you can tell your own story. This graphic is appropriate for my brand theme of destruction and havoc. I started making this board with 7 street veneers, which I glued and pressed with a vacuum bag. I woodworked the board to get it to its final shape. I painted the whole board a solid red and then I made stencils. I finished the board graphic and outlines with paint marker. In terms of woodworking I think the board turned out fairly well considering it’s my first project at OSF. In terms of the graphic I pulled off the fists but I didn’t get the other components on the sides; next time I would practice more with the paint markers. Hopefully I will get better doing stencils as well. Overall, I am satisfied with the work I’ve done, but there is a lot of room for improvement and now I know the techniques to pull it off. This was quite a learning experience and I learned how to manufacture something from nothing which is something I haven’t done in school before. 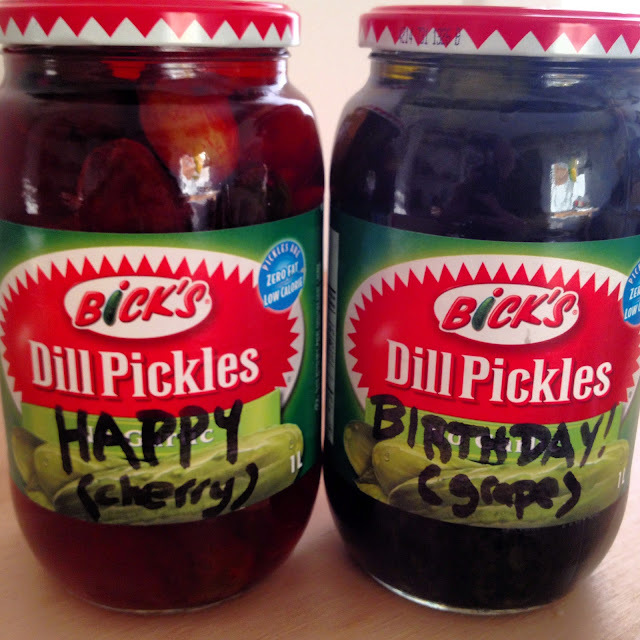 OSF Classes are back in session and it's Lauren's birthday so we're celebrating with some DIY Candy...Kool-Aid Pickles! HAPPY MARCH BREAK from OSF! Classes resume Monday March 23. Looking forward to our upcoming art show at the Gladstone Hotel April 2, 7pm when we will be auctioning off boards like this collab we did with ROCK. Hope to see you there! Hi my name is Mikel and brand is an organic, handmade skateboard company called HomeSpun SkateBoarding. My brand exists to spread the beauty of handmade objects. This my first board at OSF in my first semester here. The image on my board is a tree god; King Derwent is a character I made up for my brand. My board is Canadian Maple pressed using Roarockit technology. I enlarged my sketch and traced it onto the board and then woodburned the design on; woodburning is the style of graphic application I will be using for my brand because it’s natural and doesn’t use chemicals. I highlighted parts with green watercolour to draw the viewer’s attention and to have rhythm from the top of the board down to the bottom. Instead of sealing the board with toxic spray, I waxed the board with organic bees wax…I am the first student to do this at OSF! On my next board I will be better at doing curves with the woodburner (this was difficult on my first try!). I will also be able to get more detail in the image as my woodburning skills develop. I am very proud of this successful project and OSF has helped me get back on track with school. I haven’t missed a day yet and I can’t wait to get onto the next project! Please share & see you there! Instagram square to share...see you there! OSF Design Services available: contact us if you want custom griptape! Hi my name is Ryan and my brand is AHK which stands for "All Hour Killaz". 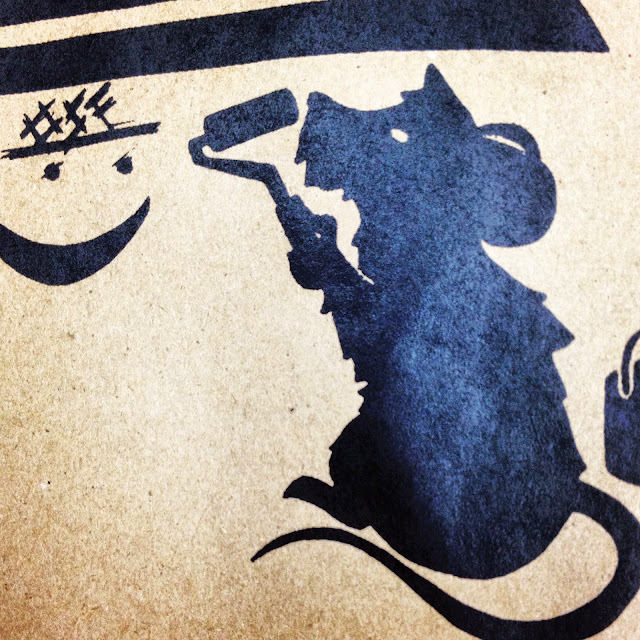 My brands exists to "Crush, Create & Collaborate" with local artists from the graffiti world. My first board is a mini for cruising through Toronto's streets. The graphic shows a guy in a ski mask holding a spraypaint can behind his back as if he's hiding it. I designed the character as an expression of my art style which is inspired by old Looney Toons cartoons. To make this board I pressed 7 layers of Canadian maple in a Roarockit vacuum bag. I shaped it with scrapers and sandpaper. I applied the graphic using stencils and spraypaint. I used paint marker for the outline. I spraypainted the bottom of the board blue with drips to balance the placement of the graphic. I'm happy with how this board turned out as my first board. I learned not to press as hard when cutting out the stencil because it leaves deep cuts on the board. I'm looking forward to coming up with more designs for AHK future projects. I came to OSF this semester from a regular highschool and this projects was my first successful school project this year! I'm excited to continue making artwork at OSF. OSF Crew Pizza & SK8 Day at CJ SKATEPARK! My name is Kevin and I recently turned 17! I’m a new student at the Oasis Skateboard Factory. For my first personal board, I decided to make a mini board; The Umbilical Board. The Umbilical Board is a baby who is being held up by his umbilical cord. The inspiration comes from horror movies and cute things I see on Tumblr. The materials I used are tape, x-acto knife, paper, spray paint, and a maple wood mini board. The technique that was used to make the board was stenciling. We would tape up the board then trace the outline of the graphic onto the tape. Then we’d proceed with cutting out the outline then spray painting it. We would do it layer by layers and eventually the graphic would be done! The elements and principle of design that I used are the value in purple, the round shapes, and the repetition of shapes and colours throughout the board. The purple on the board fades out as it approaches the head and I mostly used round shapes for the graphic. For my first board I think I did okay, it’s full of flaws but I learned to move on from them. 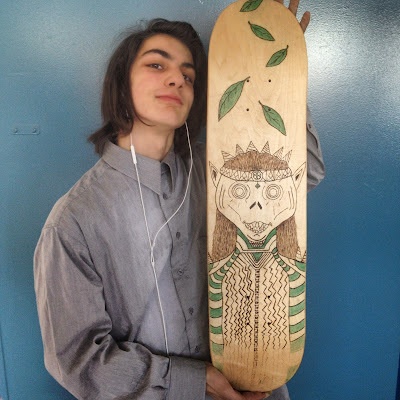 I learned how to spray paint and how to use stencils to make a skateboard design! There was a lot of work, took a lot of time, and I wasted a lot of tears but it was worth it. 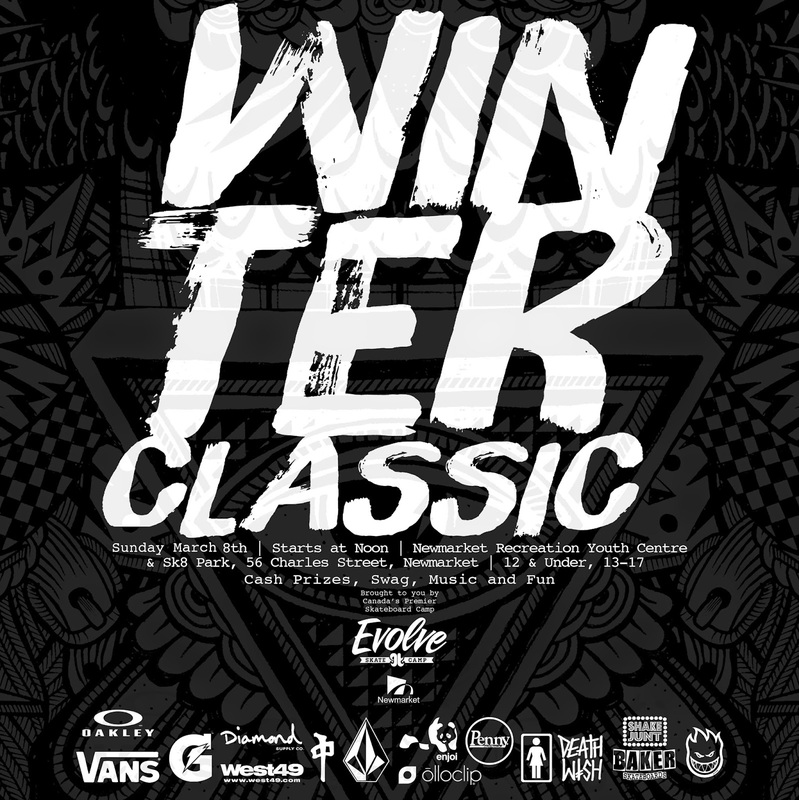 One of our Co-op Students is shooting this comp so check it out! Way Bad came all the way in from Ottawa to collab on a board with OSF! Skate session inside the Great Hall during OSF photo shoot! 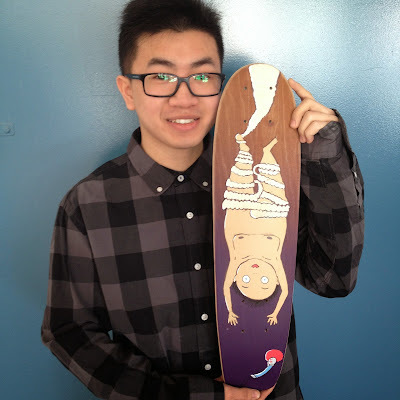 Hey I’m Johnny, I’m new here at the Oasis Skateboard Factory. The brand I created is called Bedlam. My brand statement is: ‘Bedlam exists to turn turmoil and distress into art you can ride’. By my brand statement I’m trying describe my creative process, which is taking a messed up situation I’ve been in and making a caricature of what it feels like to be in one of those situations. For my personal board here, I wanted it to follow the death of my friend a couple of years ago. In a Toronto festival my friend was mob rushed and stabbed to death. I made this board while thinking about how much one life is worth and the carelessness of mob mentality. The large baby represents an innocent person’s soul and the bodies in the upper background represent a careless mob, fueling the fire that burns the soul. The board is made up of seven maple veneers pressed in a ROARROCKIT compression bag. 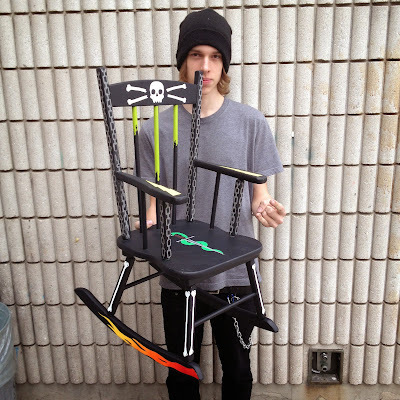 I used tape stencils and spray paint for the larger bulk of the color. I chose contrasting hots and colds for my palette because I feel like it helps define the conflict between the calm and hectic elements. The composition was inspired by tattoo style of fitting forms into existing shapes. I used paint markers to take care of the line work and this was all sealed up with a gloss coat. I plan to make my brand continue to follow things like mob mentality and balance between chaos and innocence. The biggest lessons that I learned from making this board is that planning ten steps ahead and staying patient will help a board look more professional.